A close friend carelessly posted the following meme on facebook the other day. Big mistake. I hate memes! Well … I obviously could just let it go. What follows is a logical rant in rejoinder. To deconstruct this meme, underlying this one-line phrase is a lot to unpack. For starters, let’s look at the verb phrase in bold: “owning a gun is a right.” Is not a gun an object, a thing, a tool? Like a hammer or a car? Is not the purpose in which it is used the concern and issue for debate? Just as I can get in a car and run someone off the road…or drive my kids to school. Or given a hammer I might or strike someone in the head to kill him…or use it to build a hospital or shed for my home. The tool itself can be used for good or evil. Is not the motive what is suspect? If we can agree on that much, logically speaking, is not the motive and the action by the tool more egregious than the right to own the tool? Secondly, the 2nd amendment “rights” which are alluded to here in this meme are often held up as suspect or antiquated in some way. Is this your position as well? That decisions and rights put upon us as good direction for our country in the 18th century are no longer applicable? Or just the 2nd amendment? The reason I ask is not to spark a debate but just because I am genuinely curious about which liberties and rights from the US Bill of Rights you feel might be sacrosanct (if any) and which ones are outdated and stale? That will allow me to at least find areas of common ground and understand your position. 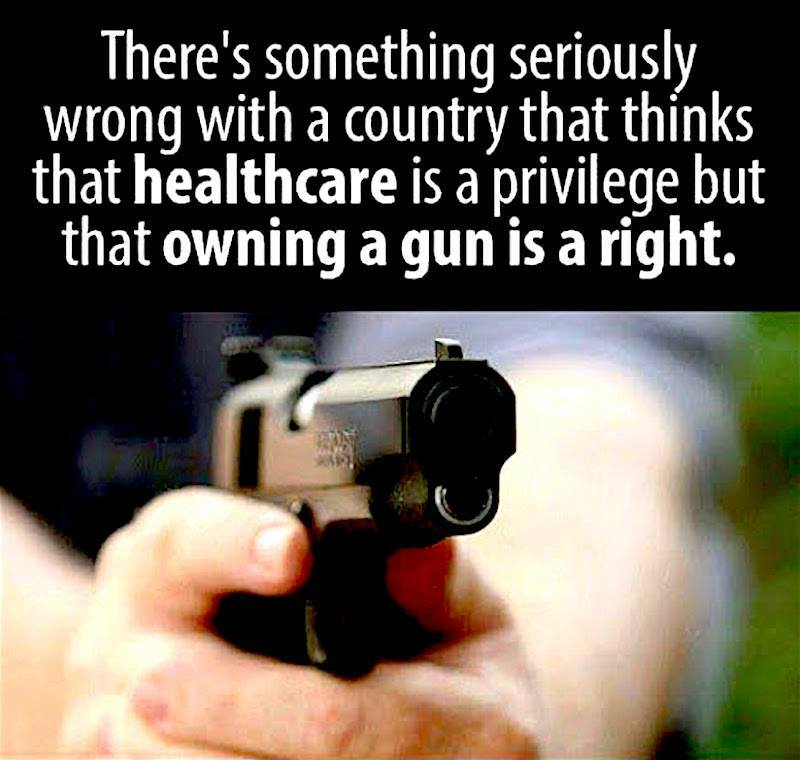 Thirdly, the main point of this meme, as I try to understand, is “how can we call gun ownership a right when healthcare is not?” Is that more or less correct? I think, legally and logically speaking, I can answer that pretty easily. The rights of our country were set up in the Bill of Rights as Amendments to our Constitution. The first ten (I believe written by James Madison) call out and elucidate constitutional protection for individual liberties. These amendments were written in direct response by many of the early states asking similar questions as we still ask today: what are true rights (“that we declare self-evident”) and which items are privileges? They are supposed to ring as clear restrictions on federal and government power against the individual and inherent liberties. See, these are not new debates! In fact we have been talking about these types of things since the founding of our nation. And (IMHO) our founding fathers did not come to the decisions rashly or quickly as to what civil liberties made up our rights and which items were privileges or services to be sought. I know you didn’t ask for a history lesson, but I sometimes struggle to know what people know and what they don’t about our country’s founding and what the Constitution actually stands for. It is an amazing read and I highly recommend it if you/others are genuinely curious about what is a civil right pertaining to our liberty and what is not. Now if the issue/gripe is that your DISAGREE with the founding fathers and their framework for the country, that’s the natural evolution of the discussion and becomes and good debate on moral, ethical, and legal precedent and justification of our current laws. I would love to have that discussion. But the simplicity of the meme which was posted prompted me to simply explain the simple tenants of American History described to most in the 4th and 5th grades. To conclude: The underlying and over-arching point here is that gun ownership (similar to ownership of any personal property) is a right because a) the act of simply owning something does not diminish someone else’s property rights or liberties (whereas improper use of that thing might and that point then edges into discussions of civil and criminal justice). b) the right to bear arms was fundamental in our country’s history because it allows a free people to rise up against its government if that government should become oppressive. Healthcare, by comparison, is not a right because it is a service performed by another person, persons, or institution. It is not anyone’s “right” to force someone to provide you a service or sell you a good. Just because a good or service is in high demand or vital to survival does not make it a right. This is why Madison and Jefferson did not describe “water, shelter, and food” as rights either. Because then the government would be called upon to provide such rights or enforce those who did not provide them. That is why areas of service are not Rights but Privileges…and this distinction is very black and white as transcribed in our founding documents and in law. So Healthcare is not a right but a privilege under the law and in our Bill of Rights. There’s your answer to this meme’s question. Me: “Well said, Tim. Couldn’t have put it better myself. From my perspective, brass tacks is that “simple solutions” aren’t always as simple as they seem. And cries of “let’s make a new right” don’t appreciate the underlying social constructs required as well as impacts and unintended consequences such a statement bears with it. Timothy Finnegan Boyle: Marco Rubio?!?! In what sense can that authoritarian be considered libertarian?! I’m also confused about the ‘talking points’ comment. I’m not sure how a thoughtful logical response to a two liner meme can be a talking point. For myself I tend to think this entire argument boils down to what does it mean to have a “right” and what are these rights. To put it simply, all human beings own their bodies and own all property that they have labored for (assuming no prior owner i.e. They homesteaded it) thus they and only they have the authority to choose what to do with their property; to sell it, trade it, consume it, or give it away. Therefore all property and transfers of property must be done voluntarily by the individuals who have the just ownership title over the property (again property meaning your own body or homesteaded or voluntarily acquired physical property). So no one has a right to anything except from the initial property right in their own body, and it is this property right in ones self and in their labor which is why slavery is wrong (slavery being the violation of a persons right to their property). Therefore when someone claims that a person has a “right” to food, or health care or whatever, what that really is saying is that one person, or a group of people are legally and morally allowed to place another person or group of people into a state of slavery where they must labor involuntarily for the benefit of someone else. And one has a right to a gun because one has a right to any object that is acquired through voluntary exchange and where the goods being exchanged were homesteaded or created without coercion and a respect for all property rights. So it isn’t a “right” to own guns as much as it is a right to exchange freely with others for any object people justly create, whether it be a hammer or a gun. But all this being said I want everyone to have access to health care, to healthy foods, and for society to be as peaceful as possible. But I would argue this can only be done through complete respect of these property rights, and thus through markets. Government only makes these things harder if not impossible. But this is all just my opinion and I don’t expect it to change anyone’s mind. I just enjoy discussing these sorts of things. Since none of us hold power it’s all simply academic. But hopefully you can understand where myself, and perhaps Sean are coming from (even though it would take volumes to fully understand my thoughts on these things). But assuming my points earlier were somewhat missed, I’ll try one last time at my original point I’ll say this last thing: my main issue with your posted picture is that it takes what I see as a complicated set of issues and tries to distill it down to a picture and a few words. I find that complicated issues deserve more than that to understand all sides and the intricacies, externalizes, and complexities. To do otherwise we sound like Trump saying stupid things like “let’s build a wall” instead of examining all the elements of the larger situation. In someways reading your meme I felt a lot like Donny in one of my favorite scenes from Donnie Darko. Seen it? Great movie. He’s asked by his teacher to put a situation on “the line of love and fear” — Donny tells her she’s ignoring the entire spectrum of human emotion. I feel that’s what silly memes do without heartfelt discussion. ← Go for the Steak, America!